I have been eating this all week. It is SO GOOD and so good for you. It reminds me of rice pudding, which I used to love when I was a kid. Chia seeds are excellent at pulling toxins and other junk out of your system, and their texture is magical when you let them sit for a little while in liquid (in this case, spiced almond mylk). They puff up! I think it's adorable. I have been biking and hiking around the past several days because it's been warm[ish] and sunny[ish] and making this recipe is what keeps me energized and fuelled. It's filling, comforting, light and delicious. I could just keep going on and on. It's like the most satisfying meal for me to make right now. I personally love topping it off with fresh fruit, especially mango and kiwi because that's what I've been buying. I like the bursts of colour they give too. AAAAANDD I think that the raisins in this recipe make it special. You get these surprise bites of sweetness and ugh maybe I am too obsessed with food experiences but it just seems heavenly to me. Like, what else could I ask for? I have chia pudding with raisins! Okay I feel like I am not making much sense anymore... I haven't worked out yet today so my brain ain't workin' right and thus my writing suffers. If you think chia is weird, try this recipe and prove yourself wrong (or you might still think it's weird, so you'd actually prove yourself right... which is rewarding!) 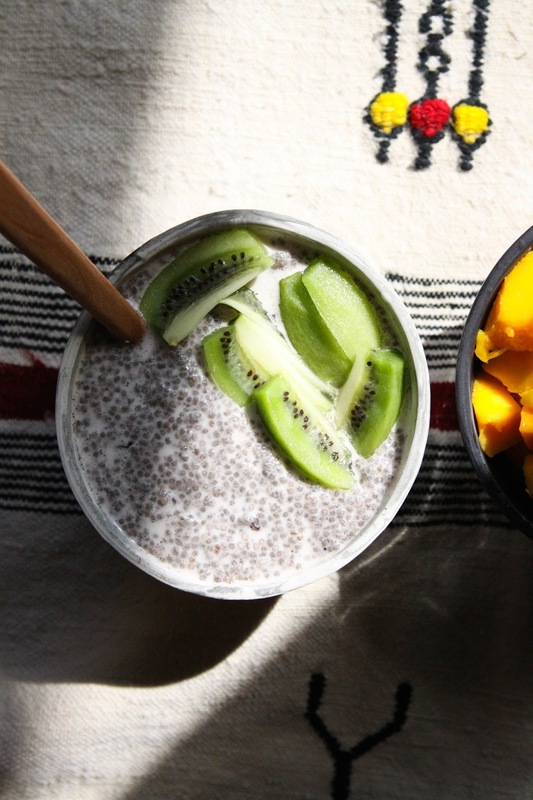 If you like chia and have been wanting to try making chia pudding: do it, babe. *Note: the lovely wooden spoon dunked in the pudding is from PARK WOODSHOP. Blend together the water, almond butter, cinnamon, vanilla and maple syrup. You just made really yummy almond mylk. Pour the mylk into a bowl and then stir in the chia seeds and raisins. Let this sit for a couple hours, or until the chia seeds have puffed up and soaked up all the extra almond mylk. If you're really impatient, use half the mylk so you don't have to wait as long. But personally I think it's best when the chia is really puffy (which takes a bit longer). Top with fresh and/or frozen fruit and whatever else you like. Nom! I love chia seeds! They are crunchy and soft at the same time and full of nutrients! 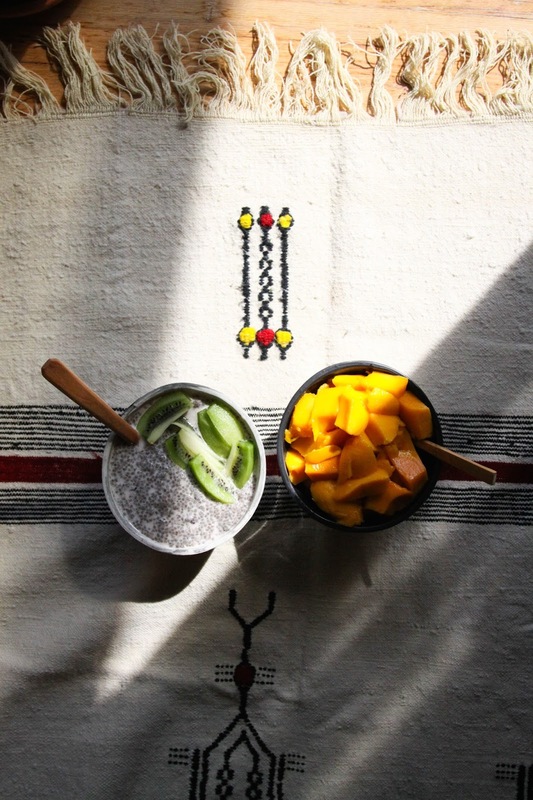 I love chia seed pudding for breakfast - such an easy thing to take on the go! I've seen chia pudding everywhere, but I don't have chia :( would it work with flax? Oooohh- Chia pudding with raisins. So much yum! I love reading your posts. I'm going to make this in the am. or do you think I can leave it overnight and it will be ok in the am? I have only recently jumped on the chai seed bandwagon and I love it!!! :) can't wait to try this recipe it sounds amazing as are so many others of yours! You and your recipe's give me so much inspiration I'm so glad I stumbled onto your blog a few years ago! Hi! Looks delicious. Is there a brand of vanilla powder you recommend? How could I not try this chia pudding, after you practically swooned over it, making my mouth drool with your description? I made a double batch tonight, and it is amazing!!! I have already gone back for a second small bowl, and am planning a third... I am going to have to fight off my son though, as he also thought it was delicious. I was planning on making it as a treat for my husband, for after he gets off work, but I don't think any will be left. Thank you for a fantastic super simple recipe! First time at your site trying all the yummy delights..made this last night..the almond milk was heavenly! I left the pudding overnight in the fridge, but it came out too thick this morning. So I suggest either less chia, more milk, or a less soak time. I just made more milk & it was perfect. Thank you! So simple and perfectly delicious. My favorite chia pudding now.